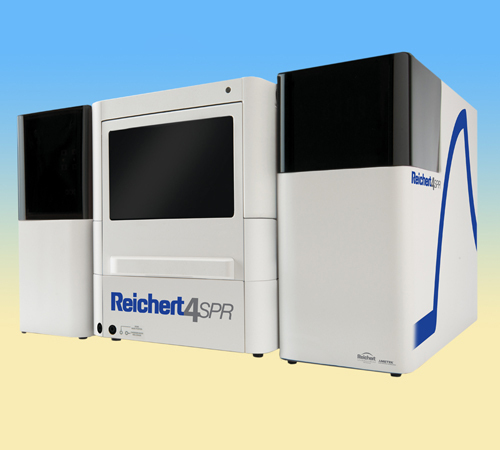 Reichert Technologies – Life Sciences, a business unit of AMETEK Ultra Precision Technologies, today launched the Reichert4SPR, its new 4-channel surface plasmon resonance (SPR) system for label-free, real-time investigation of biomolecular interactions. By combining four channels with improved industry-leading sensitivity and baseline stability, Reichert4SPR enables drug discovery researchers to maximize their efficiency, flexibility and throughput. Building upon Reichert’s 15 years of experience developing flexible, affordable, and extremely sensitive SPR systems, the Reichert4SPR features the latest advancements in optics, image sensing, electronics and software. “Reichert’s latest product offering immensely improves the speed and quality of data in the drug discovery process for both pharmaceutical and biotechnology companies,” notes Phil Page, Application Scientist for Reichert Life Sciences. The Reichert4SPR’s four channels vastly improve the efficiency of the drug discovery process by increasing throughput and study design flexibility. A researcher can run three experimental channels with one reference, two experimental channels with two separate references, or test different immobilization chemistries or regeneration schemes on each channel. “Phenomenal sensitivity and baseline stability make the Reichert4SPR the ideal instrument for kinetic or concentration determination experiments of macromolecules and small molecules,” adds Page. The Reichert4SPR’s high sensitivity (+/- 0.05 ?RIU rms noise) reduces the amount of sample required for each experiment and produces results even if a large portion of the protein sample is inactive or denatured. This makes the instrument perfect for analyzing small molecules or very low concentrations of larger biomolecules. The Reichert4SPR also is able to determine picomolar concentrations and equilibrium dissociation constants and has a low baseline drift (0.01 ?RIU min-1), which improves data fitting. Reichert has developed enhanced software for the Reichert4SPR, with features that include integrated, seamless data analysis with multiple binding models, easy data comparison, extensive reporting capabilities, and numerous features to normalize and optimize data fitting. The system is designed to use standard tubing and fittings and can run aggregate, precipitate or lysate samples. The fluidics tubing is easy to access and change for lower maintenance and operating costs. The newly introduced 4-channel system provides more value at the time of purchase and lowers operating costs thanks to the added advantage of an easy-to-access fluidics system. In summary, the Reichert4SPR’s five-year total cost of ownership is 30 percent lower than that of its leading competition. With unparalleled sensitivity and baseline stability, the Reichert4SPR offers the best value on the market. Reichert's SPR systems provide the diverse interests of academia and industry with the most cost-effective, sensitive and flexible platforms in today's marketplace. These systems supply a comprehensive characterization of molecular interactions that are important to researchers in numerous scientific disciplines, including drug discovery. These interactions include but are not limited to protein–protein, protein–peptide, protein–nucleic acid and protein–small molecule. Reichert systems generate information-rich data to determine such key parameters as binding association and dissociation rate constants (kinetics), equilibrium (affinity) constants, thermodynamics and concentration. The systems give invaluable insight into the dynamics of protein-binding assays that govern chemical and biological processes. The new four-channel Reichert4SPR system’s leading technology delivers lower baseline drift and improved sensitivity. Reichert Technologies is a unit of AMETEK Ultra Precision Technologies a division of AMETEK, Inc., s a global leader in electronic instruments and electromechanical devices.